Donald Trump Jr. recently likened his father’s proposed border wall with Mexico to that of a zoo fence meant to contain animals. “You know why you can enjoy a day at the zoo?” the now-deleted Instagram post asks. 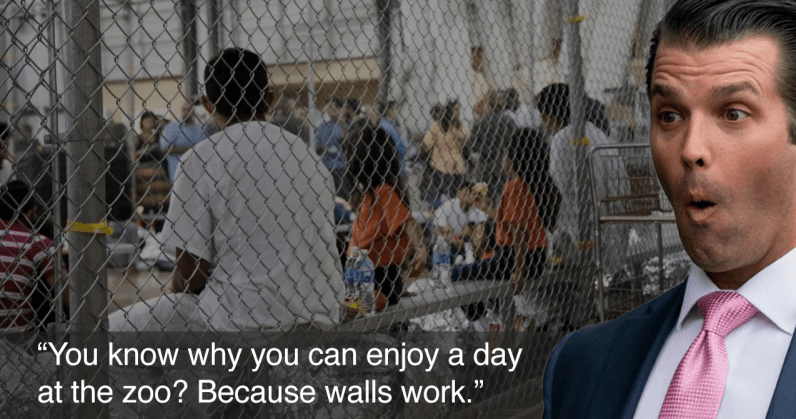 “Because walls work. At face value, the comment is insensitive. But given the administration’s history — calling Mexicans criminals and rapists, locking Guatemalan and Honduran children in cages, proclaiming there were “good people on both sides” at a neo-Nazi rally in Charlotte, and proposing a Muslim travel ban — it’s easy to see why some see this as yet another in a series of dog whistles to the lowest common denominator of Trump’s base. A spokesperson for Trump Jr. said that the post was meant to highlight the danger associated with an unsecured border. As the government shutdown enters its third week, it’s clear that wall-related posturing has reached a fever pitch. Trump Sr., for his part, claims he will not sign a budget proposal without more than five billion in funding for a border wall he promised while campaigning — the same wall he assured us Mexico would pay for, before walking that back and saying he “obviously” didn’t mean it. For Trump Jr. — who, let’s be honest, uses Instagram like a 16-year-old meme collector — this isn’t his first xenophobic controversy. You may remember his Skittles meme, from Twitter, where he likened Syrian refugees to a bowl of poisoned candy. If I had a bowl of Skittles and I told you just three would kill you. Would you take a handful? That’s our Syrian refugee problem. Unsurprisingly, the metaphor whiffed. It’s not just that it was xenophobic, but scientifically flawed, as pointed out by Washington Post journalist Phillip Bump. According to the US National Safety Council, Americans have a 1 in 3,408 chance of choking to death on said Skittles (or any food, really), compared to a 1 in 3.6 billion chance of being killed by a refugee in a terror attack. Bump had some fun with these numbers and found that the science of scale didn’t work in Trump Jr.’s favor. All told, it’d take one-and-a-half Olympic swimming pools of Skittles to get three poisoned candies — meaning, you’d have one fatal Skittle in every 68.7 million handfuls. Assuming you could eat one handful a minute, on average, it could take 130 years to find the poisoned candy. That’s assuming you live long enough to find it. You’d be consuming about 330,000 calories a day. Let’s get one thing straight. The only thing Donnie Jr. puts first is hair gel — followed closely by bad metaphors.